"You're not the bad guys… we are." Another new Heat wannabe movie. 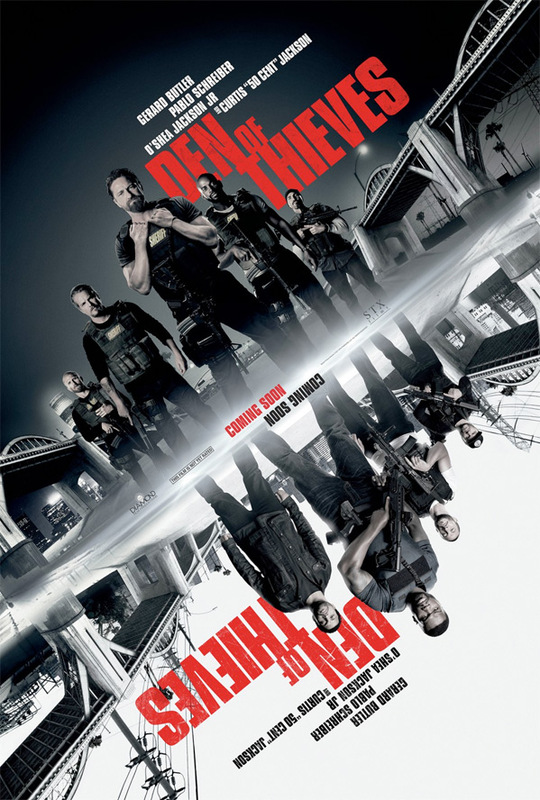 STX Entertainment has dropped the first trailer for an action crime thriller titled Den of Thieves, from writer/director Christian Gudegast. The movie is about a thief who gets trapped between two sides of a heist and two sets of "criminals" - an elite unit of the LA County Sheriff's Dept. and the state's most successful bank robbery crew. Gerard Butler stars, with 50 Cent, Pablo Schreiber, O'Shea Jackson Jr., Sonya Balmores, Maurice Compte, Evan Jones, Brian Van Holt, Jordan Bridges, and Eric Braeden. This seems like it's going to have quite a few big twists, and characters who don't turn out to be who they seem to be (obviously enough). With Gerard Butler, 50 Cent, and a January release date, this is pretty much a disaster in the making. Have fun.